I really didn't mean to make another Briar Rose project... I just wanted something to tryout my new Drunkard's Path templates and the scraps were just sitting there on the edge of my cutting table. Next thing I knew I had a stack cut out and I was on my way. 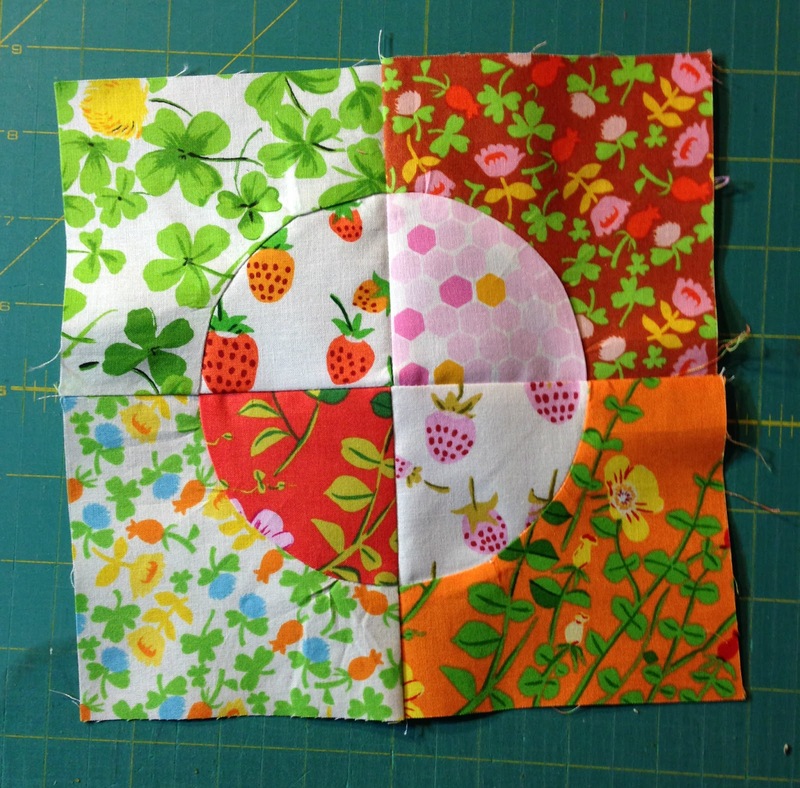 There are a million great tutorials out there on curved piecing. 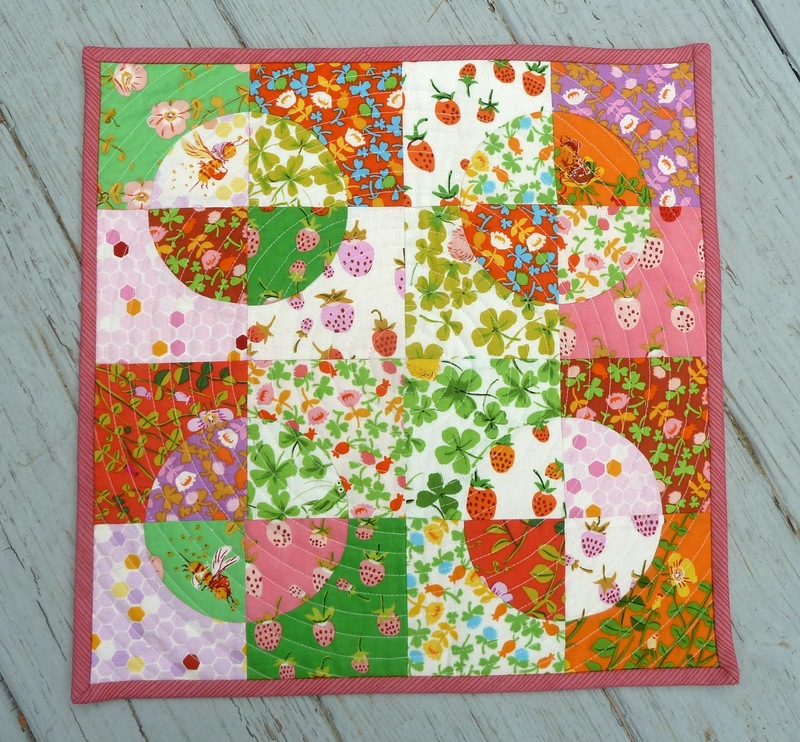 For these 3 1/2" squares I had the best results pinning using Amanda Jean's technique. In no time at all I had them pieced together. For the quilting I just decided to do a spiral. It's a little wonky in the middle but it gets easier as you work your way out... quilting it was definitely giving me the spins. 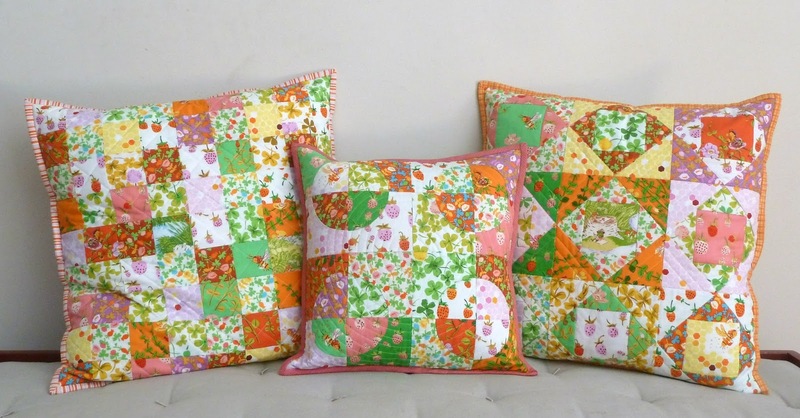 And here's the collection... 3 pillows and 2 quilts from a fat quarter bundle. I finally busted into my Mendocino this week... I've got full yards of that one so be prepared. 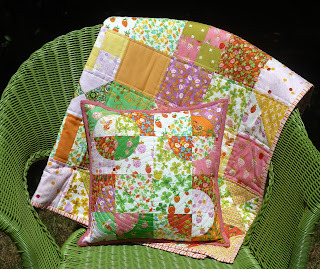 Until my next bender... Chillin' with this week's Finish it Up Friday by Crazy Mom Quilts. 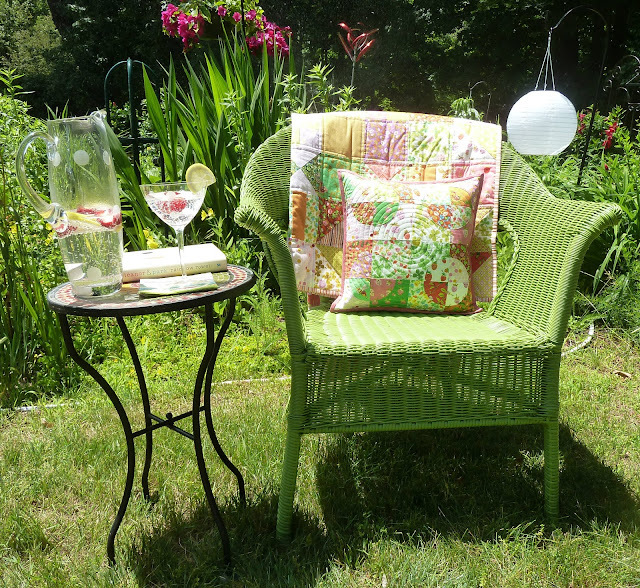 Fabrics: Briar Rose by Heather Ross. Binding Wee WoodLand by Keiki. Oh what a neat pillow. The fabrics are fabulous and I love how you quilted it. Thanks for sharing. 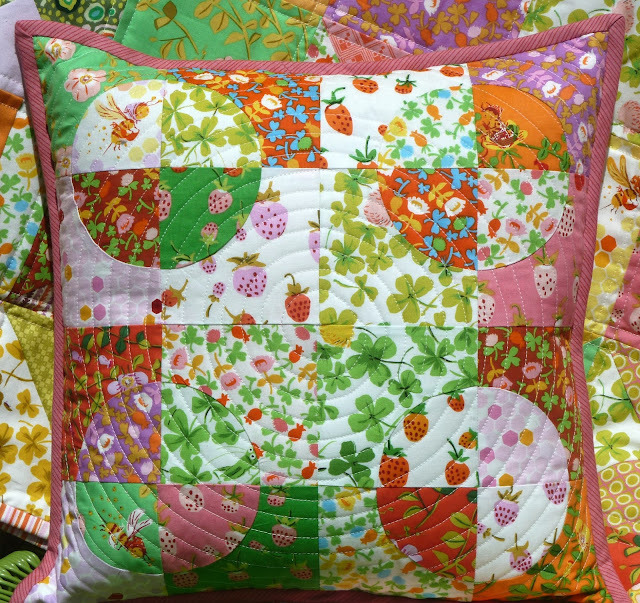 What beautiful garden pillow. Love how perfect those circles are and that circle quilting is divine! Oh my, Heather Ross is my favorite and I love what you did with the blocks. Can't wait to see what you do with Mendocino. 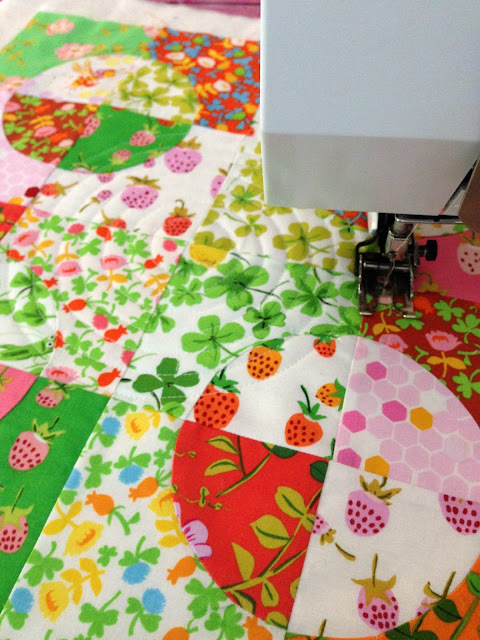 It's the fabric that brought me to quilting. :) Happy sewing! So pretty - I can just imagine you sitting outside enjoying your summer weather, drink and book to hand! It's winter down where I live in New Zealand, wet and miserable. Good sewing weather, though. Very nice pillow ! And I really love the picture outside. 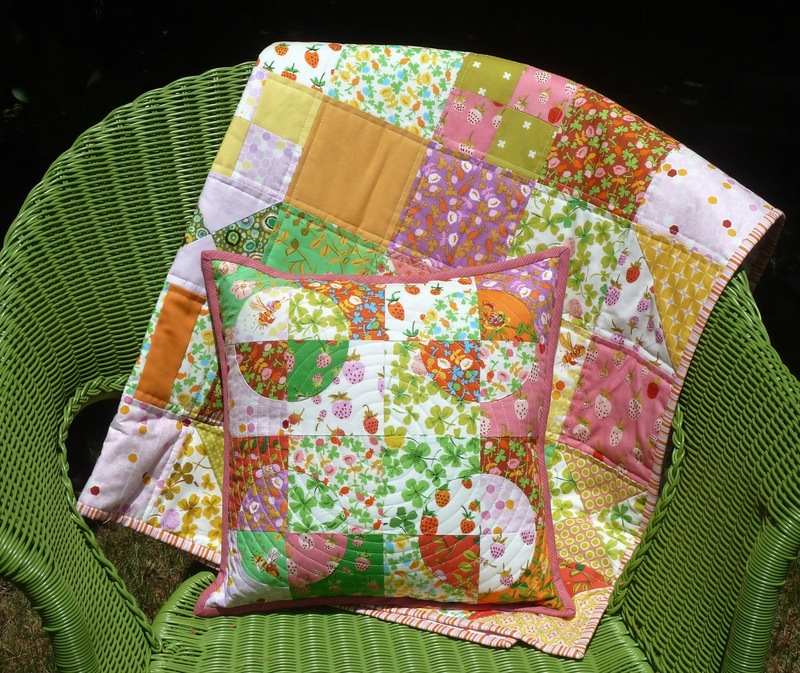 Found you on Crazy Mom Quilts and LOVE the pillow you made with that spiral quilting. The fabric is gorgeous!